I have been streamlining the post production elements of photographing my toy soldiers. Im still struggling a bit to correct some white balance in the portrait shots, but mucking around a little with the more atmospheric shots is proving to be fun. There is a LOAD of room for improvement of course, but if I could show these photos to my twelve year old self, twelve year old me would flip out. Flip out like a ninja. 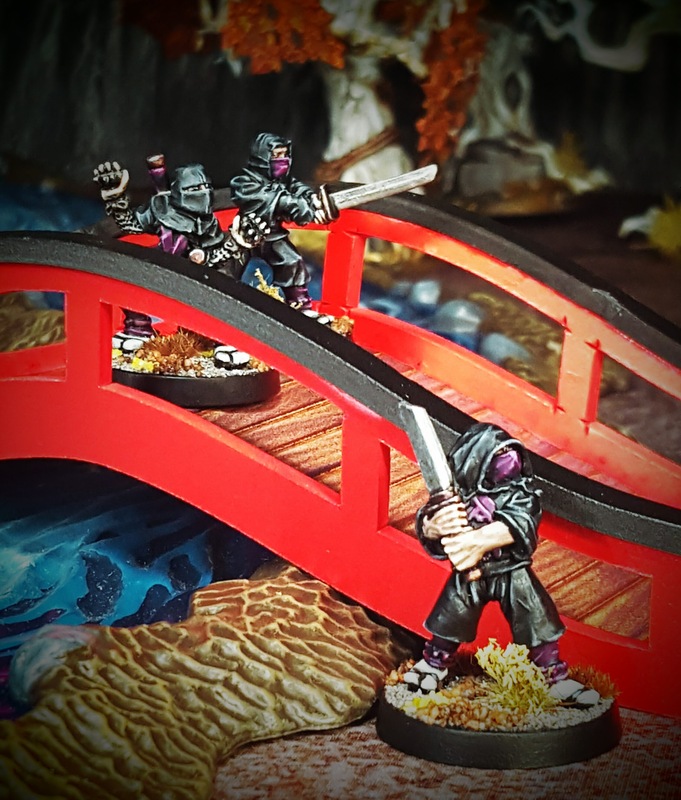 I bought some pre-coloured terrain from PlastKraft – a torii gate, a bridge and a dojo – primarily to serve as photo backdrops for my Shonen Knives project. They were a breeze to assemble and I will definitely be picking up more of the range. They are the pieces in these shots. Something a little more substantial soon I hope. More Shonen Knives for certain. I picked the terrain up primarily for photo backdrops really, although I like it sufficiently to have an eye on the rest of the range. Well done! I bought some of their unpainted stuff a while back. (The venetian two story from the Carnivale range.) Looking forward to it actually. Have to figure out where I put it in the move. As always, thank you for the inspiration. I also bought some of the unpainted items from another range, for another project. If they assemble as easily as these do then it will be very pleasant to work on. The pre-coloured elements with these kits made them a very different proposition though, they come together into something useful very quickly. I’m quite impressed by that prepaint terrain, I can see you touched it up a bit but even out of the box it appears solid. These photos came out quite atmospheric, I must say. Other than adding glue (superglue gel was perfect for the task) the only touch up I did was with a brown felt tip pen. I used that to colour in the inevitable exposed edges on the corners where certain components meet. I should have mentioned that in the post actually. Thanks for the feedback No Such Agency. Those pictures are wonderful Paul, I think with models the right setting & only seen what is the model’s world really adds a lot, I’ve done a couple of post on it over on my blog. I’m glad to see reference to Maj. Guiscard in that post Frank. The work over in Sector Six is inspirational. 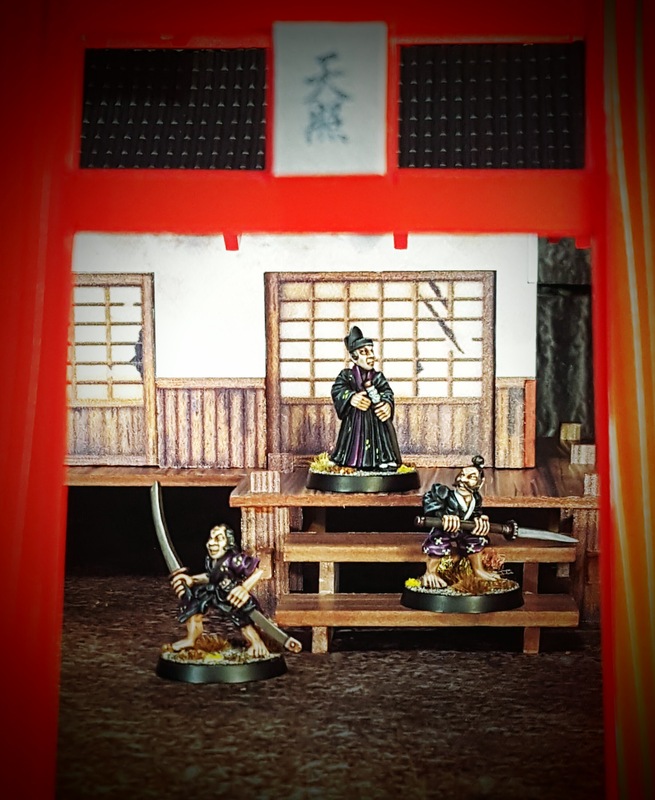 A lot of the hobby is budget set design in miniature for me. The photography needs lots more work, but it’s gradually improving I reckon. Gyaaaaaah, this painfully reminds me how much models require scenery to give their full. 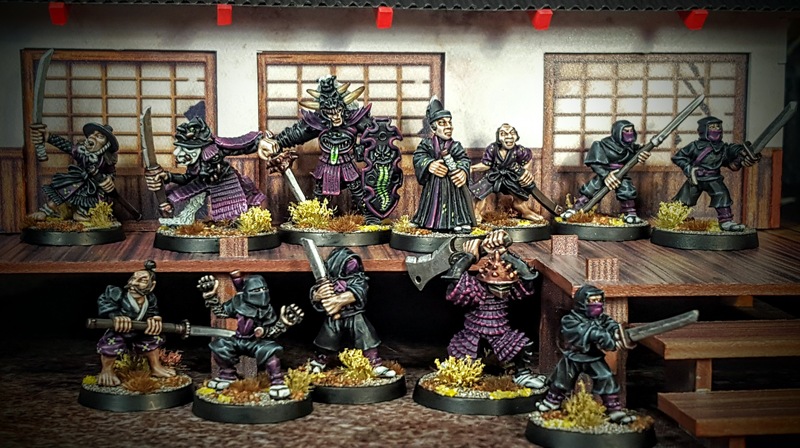 Here’s a great look on those, I’m starting to find painted models without proper scenery are like models without the base done or like making love with your socks on. WRONG. Thanks for making part of the world a little right Paul (insert favourite drop/ocean anaogy here). 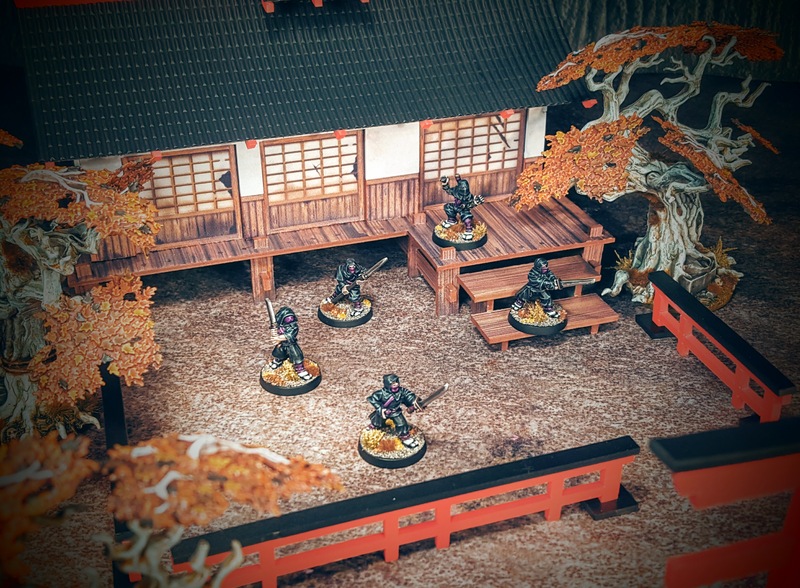 These bits of terrain are the first that I have bought primarily as photo backdrop pieces (although I suspect that they will be expanded into a terrain set soon due to how nice they look). Only a few bits and pieces of set dressing are required to take some atmospheric photos, you don’t need a full tables worth. In fact, all you really need are a couple of walls (like “flats” in theatre sets) and some other scatter pieces, like pots, jars and crates. You can manage that, I’m certain. As a fan of atmospheric shots I find yours just wonderful. 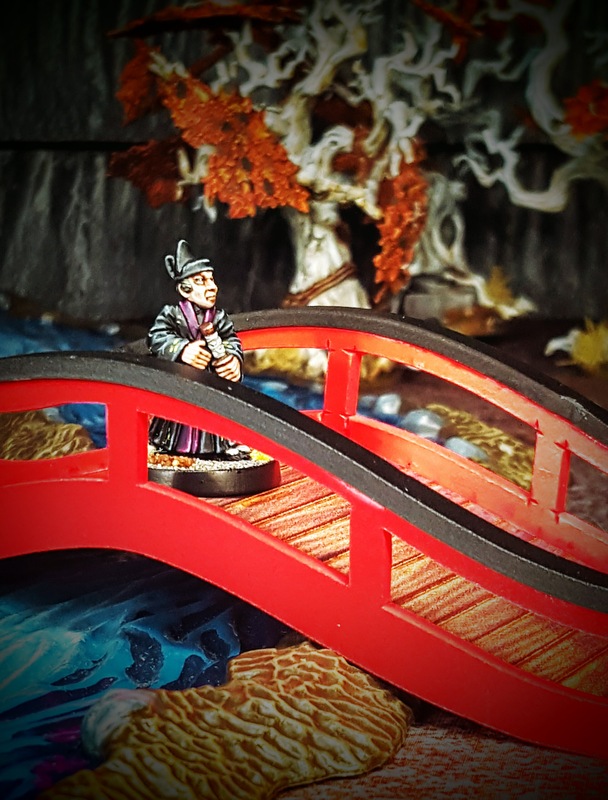 Especially the ones with miniatures on the bright red bridge remind me actually of Japanese paintings, with clearly delienated surfaces and more uniformly coloured areas. Very inspiring! Obviously I am experimenting at a fairly basic level, but there is improvement there. Gotta start somewhere. Thanks for the encouragement daggerand brush. On a more tangible note, I found the tutorials on your blog regarding composition very helpful. Glad the tutorials were of use. I wouldn’t call your efforts to be on a basic level. The composition is very good and the picture quality, too.